"The average person thinks about energy use for only nine minutes per year," according to Deena Rosen, Senior Director of User Experience at Opower. During her presentation at GTM's Soft Grid event today, Rosen spoke about how data obtained by utilities can be translated into insight and action. 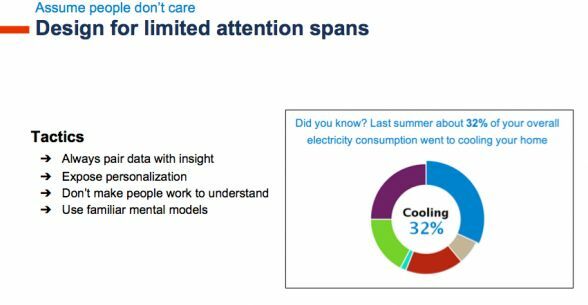 "Data analytics is the most important frontier for utilities seeking to modernize their business," she said, but she added that Opower's point of view is "analytics alone will not accomplish customer-driven utility objectives." The Opower director said that analytic content needs to be delivered to the right people at the right time and has to ensure a great customer experience. Rosen used the word "nudge" a lot during her 30-minute talk. This seems to be what behavioral scientists think about: gently nudging people to make better decisions. A "standard view" presumes that people make decisions as rational actors and self-optimizing agents based on careful research. In a behavioral view of the world, we are swayed by our emotions and make decisions automatically, based on certain well-established cues. Rosen noted that this "doesn't make us irrational or stupid," just human. Behavioral science suggests we can design to address these cues. 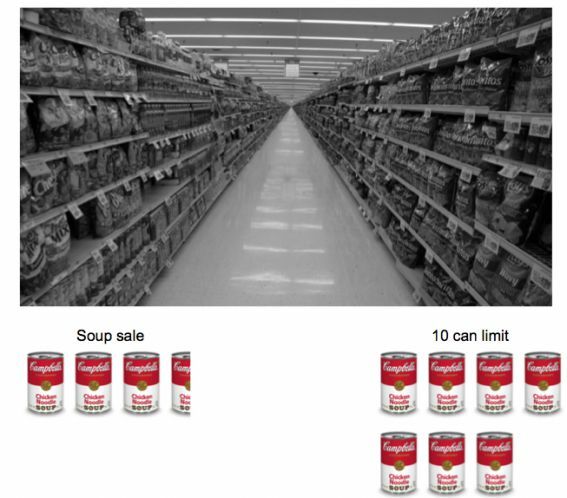 Rosen cited the "soup sale" example: When soup is sold "half-off," an average of 3.5 cans are sold per customer. When a "10-can limit" sign is posted, the average sale jumps to 7 cans because the limit implies scarcity and "helps anchor you." It makes ten cans seem like a reasonable purchase, even though you only want 3.5 cans. "That's an example of how people's behavior can be predicted," said Rosen. She notes, "If you can design for that behavior, then you can change their decisions. This is called behavioral design." "Take a look at this trash can and notice what a difference one word can make." Changing the label on the can from "trash" to "landfill" might change a decision "at that key point where I'm about to throw something away. 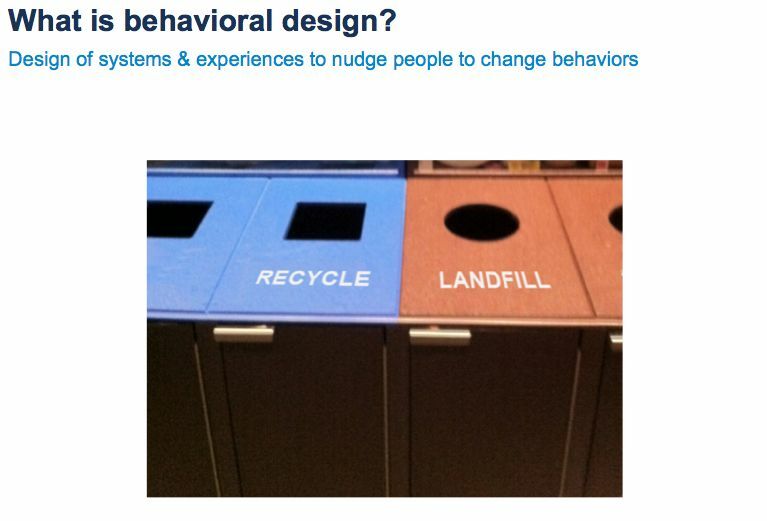 This is behavioral design," she said, adding, "At Opower, we've become experts in behavioral design for energy users." Rosen said that Opower has developed a set of guiding design principles. Design for the way people actually behave. "This is all about designing for the behavioral view of the world," said Rosen. She suggests that "we're all more similarly wired than we may like to think -- and we can design for that predictability." Opower makes use of social norms, testimonials and commitments to "nudge" people to make a decision. One effective method is providing "a normative comparison [to a user's] neighbors," said Rosen, adding, "It's a really powerful technique for getting people's attention and motivating them." Assume people don't care. Referring to the Accenture statistic that the average person thinks about energy use for only nine minutes a year, Rosen noted that the figure had recently been "upgraded" from six minutes. "We have to remind ourselves of this at Opower. [People] are not thinking about their smart meters every day." She spoke of the need to assume the "burden of relevance: boring until proven otherwise." To combat this, she said, "We always pair data with insights so people aren't looking at raw data," adding, "We use familiar mental models so people don't have to work to understand what's going on." She notes that "a typical utility bill...doesn't follow any of these guidelines and is not engaging." Always lead to action. Rosen acknowledged that people often have "great intentions," but added, "If our intent as designers is to move you toward an action -- we have to make that action as easy for you as possible." She noted that the simple act of buying and installing a low-flow showerhead has many "potential dropoff points" which can be proactively addressed with coupons, reminders, testimonials product reviews -- delivered in the "right order." "An outcome we wanted to achieve was for people to adjust their thermostat before they leave the house." She suggested that all the education about thermostats would not be as helpful as a simple reminder as you are leaving the house. 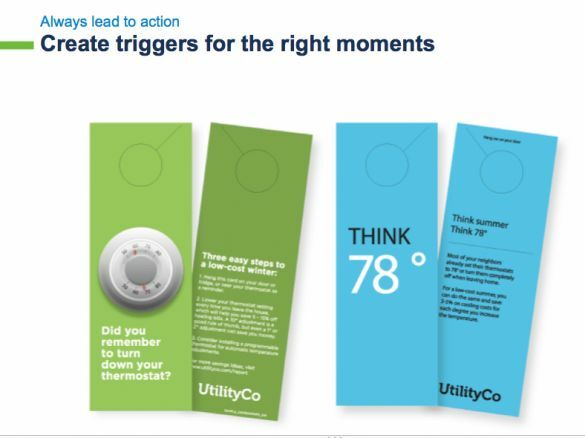 Opower created door hangers that gave "a lift in energy efficiency" at eight of the nine utilities where they were tested. Aim for a long-term relationship. Rosen notes that a political campaign can afford to annoy you in order to get your one-time vote. "We don't have that luxury in this industry. We need to design for a long-term relationship," she said, adding, "We have to nudge you in a way that doesn't annoy you. One of the ways we do this is that we always try to enable a two-way conversation." Opower looks for customer participation and feedback in its communications. Build for everyone. 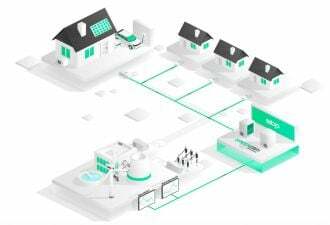 "Energy users are not a tidy, well-defined group," said Rosen, adding that "35 percent are renters that don't have complete control over the building they live in," and 70 percent are not reachable via digital channels. She also noted that 8 percent of all men are colorblind and can't distinguish charts based on color alone. Rosen said that the goal is to understand the available channels. She gave an example of two marketing messages trying to drive the same outcome -- "nudging people to take a home audit." 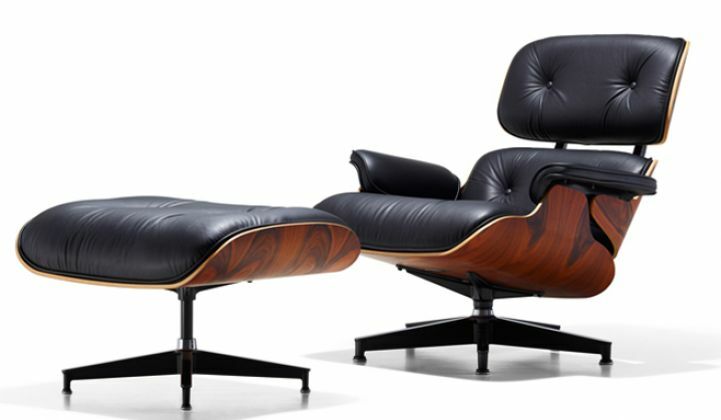 One was marketed to the environmentally minded and featured "green" iconography. The other was marketed to "energy-efficiency skeptics" and focused on making sure that the home was not wasteful. She said, "The call to action was the same." View the Soft Grid 2014 live stream here.